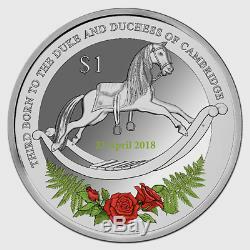 This stunning 1oz silver proof coin commemorates the birth of the Duke and Duchess of Cambridges third born child, Prince Louis of Cambridge, celebrating New Zealands close relationship with the British monarchy. 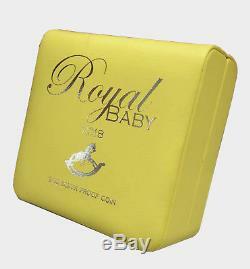 2018 Royal Baby Silver Proof Coin. The Duke and Duchess of Cambridge have welcomed their third child to their ever-growing royal family. New Zealand Post is proud to celebrate the arrival of their newest addition Prince Louis of Cambridge with a collectable commemorative coin. 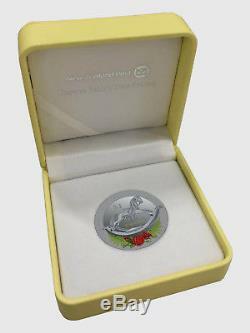 This intricately detailed 1oz silver proof coin reflects the close relationship that New Zealand has with the Monarchy as a Commonwealth nation. The centre depicts a royal family heirloom: a rocking horse that belonged to Princess Margaret. Beneath the rocking horse on the rim of the coin is the English rose, combined with the New Zealand fern. It will also feature the baby's date of birth. Portrait of Her Majesty Queen Elizabeth II by Ian Rank-Broadley, United Kingdom. Traditional family heirloom rocking horse with English rose and New Zealand fern motif. Saint Andrew Matautia, New Zealand Post. Mint of Norway MINTAGE: 606. 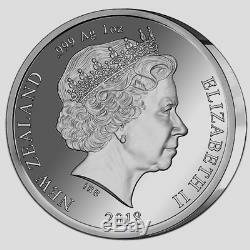 The item "New Zealand 2018 1 OZ Silver Proof Coin- Royal Baby Prince Louis mintage 606" is in sale since Tuesday, May 8, 2018. This item is in the category "Coins & Paper Money\Coins\ World\Australia & Oceania\New Zealand". The seller is "silvergoldbullion" and is located in Rangiora. This item can be shipped worldwide.